Consumer Watchdog: Why are they here? 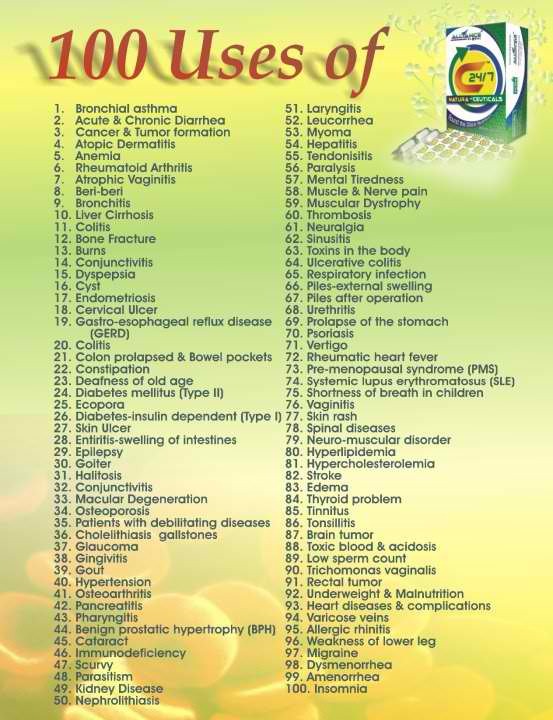 However, and this is common among companies offering supplements, their distributors make some remarkable claims. 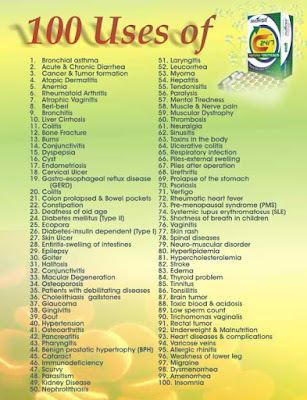 I found one who claimed that AIM Global’s “C247” product could help with 100 different serious medical conditions including asthma, beri-beri, cirrhosis, bone fracture, deafness, endometriosis, epilepsy, hypertension, hepatitis, “toxins in the body”, stroke, migraine and even cancer and “immunodeficiency”. We all know what that last claim means, don’t we? Another headlined his blog post with the title “Cure For Cancer Is Possible!” before claiming that their products can offer such a cure. These are all lies and the clue is obvious. If such a miraculous, magical product existed, someone would been awarded the Nobel Prize for Medicine by now, if not even the prize for Peace as well. And they haven’t. No single product could do any of those things, certainly not all of them. So it’s safe to assume they’re lying. Like all similar schemes the important thing to note is that the products aren’t important. Look back at the Facebook post above and you’ll notice something interesting. They don’t mention the products. They give you no clue whether the products this company sells are nutritional supplements, dishwashers or saucepans. That’s because they don’t care. Like the other schemes the real attraction is making money. 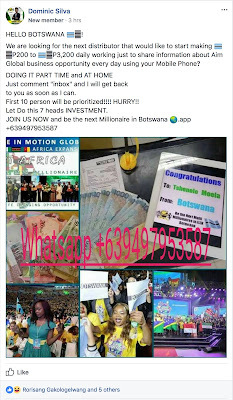 Phrases like “P200 to P3,200 daily”, “business opportunity” and “be the next Millionaire in your Country” tell you all you need to know. Let’s go back to the original question. Why are they visiting us (electronically) us in Botswana? 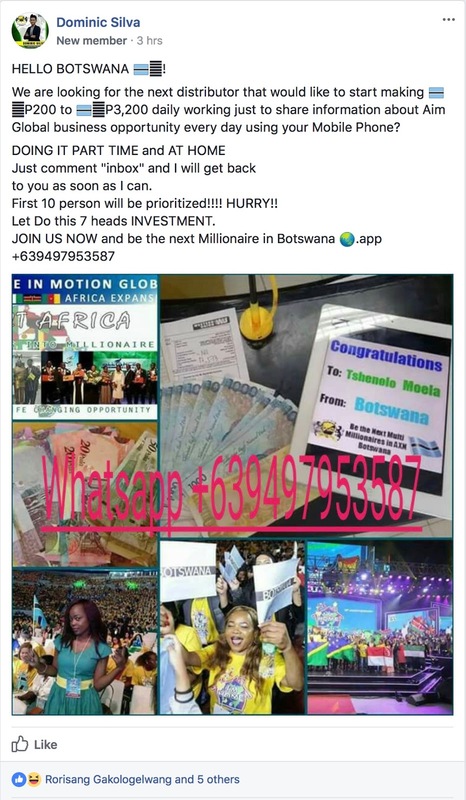 Why would people in the Philippines try to get people in Botswana to join this business? If the business is so successful, why aren’t they trying to recruit people in their own neighbourhood? Why aren’t they recruiting Filipinos? That one I can answer based on personal experience. As someone who worked and lived for a short period in the Philippines, I can tell you with some certainty that Filipinos are a skeptical nation. They lived through dictatorial oppression and they know to be skeptical about scams like AIM Global. I suspect AIM Global have emptied the pool of gullible victims over there and are now exploring new regions to exploit.